Stone type: Coarse-grained, bedded yellow sandstone. 134.6cm (53'') high, 46cm to 35.5cm (18'' to 14'') wide, and 25.4cm to 17cm (10'' to 6.7'') deep. 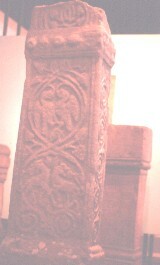 Cross shaft, dated to the beginning of the ninth century. The faces of the shaft are enclosed in a fine double roll moulding and the collar, which divides of the lower section, is grooved and there are five studs on this face. Above the collar there is a surviving portion of a tangled scroll with short triangular leaves. Below the collar the panel is covered by an inhabited scroll composed of two interlaced medallions. At the top there are four strands tied together in a bow. In the upper medallion there is a pair of birds. The birds are each displaying one wing. Between the two medallions there are four short triangular leaves with sunken centres. In the lower medallion there are two animals with canine heads. Their jaws are open and their tails are hooked around the scroll. One of the front legs of each creature crosses the other's.